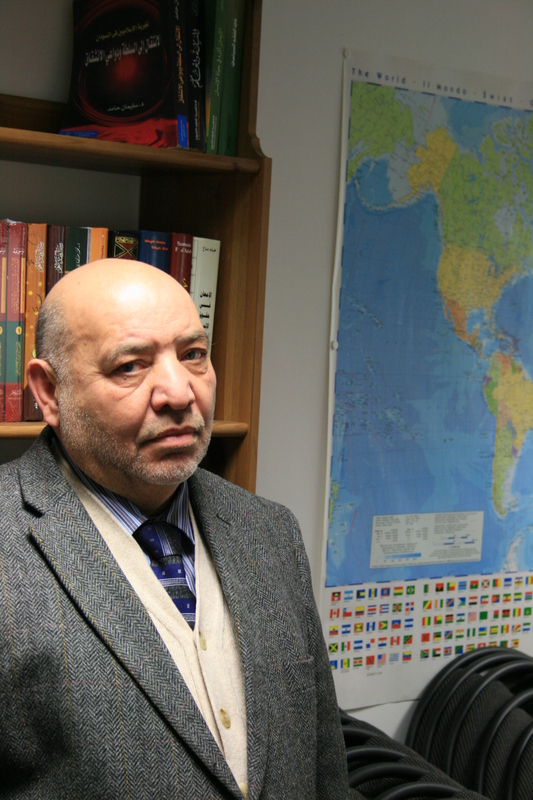 Out of all the places to meet Zuheir Salem, the number two man of the Syrian Muslim Brotherhood (SMB), a David Brent-style office in Alperton, north London, is probably the least expected. The office of the SMB is so elusive that even the security guard does not know what the SMB are or what they do. According to him, it is some sort of charity where lots of Middle Eastern-looking types come in for meetings and leave late. “I don’t ask any questions, boss–if you know what I mean,” he says with a knowing wink. Such secrecy is hardly surprising, considering that the SMB were wiped out by Hafez Al-Assad in the 1980s. They are set to make a comeback. Zuheir Salem himself appears to be more like an academic than a back-room dealer. Salem has been a Brotherhood member since the age of fifteen, and comes from a respected and religiously conservative family from Aleppo. His membership in the Brotherhood resulted in exile, which took him across the Middle East and Europe. Only now, after forty years, has he received refugee status. Although he is a prolific commentator in the Arab media, he has received surprisingly little attention from the Western media. One wonders why the Western media, who worry much about the influence of the Syrian Brotherhood in a post-Assad Syria, don’t just pick up the telephone and speak to a man who is only around the corner. Q: Is the Syrian Muslim Brotherhood happy with the appointment of Ghassan Hitto? Zuheir Salem: There were a lot of candidates to start with, but we narrowed them down to a few. Of course, the opposition tried to agree on one candidate, but that was difficult. There were two factions who were insisting on supporting their respective candidates. Mr. Ghassan Hitto was fortunate to be chosen. The SMB had said that they would support the candidate who received the most votes. Since Ghassan Hitto had the most votes, we gave him our support–not because he was our preferred candidate. Q: What do you make of Moaz Al-Khatib’s resignation? Khatib is not from a political background; he is a religious man, an engineer by profession and a man of integrity. The resignation is to do with lack of political experience, but also due to the feeling of responsibility for all the deaths in Syria, especially as he cannot do anything about it and the world isn’t helping. In such a situation, it is easy to say to oneself, ‘If I was outside of this framework, perhaps I could do more.’ I don’t mean this to be a criticism, but rather as a description of his current state. Q: How do you see the killing of Sheikh Ramadan Bouti? We simply don’t know what happened, but you could make an educated guess. I don’t consider the sheikh a hypocrite, but I criticize his political position. This has caused a lot of suffering to those who followed him. No one from the opposition has claimed responsibility for his death–even the radicals have not claimed it as their doing. The Jubhat Al-Nusra [Al-Nusra Front] have denied any involvement. They usually claim responsibility for anything that they do, but they have not. Instead, it seems that the regime has been stoking the propaganda machine to create this fear of terrorism. I believe that the person who killed him was Bashar Al-Assad. The regime has a precedent of killing its friends, including Mahmud Al-Zobi, Ghazi Kanaan, Mugniyeh, [and] Muhammad Suleiman. Whilst this is speculation, the regime has an interest in Buti’s killing; perhaps it wants to convince the international community that there really are extremists in their midst who are now in control. Q: Do the differences among the opposition indicate political inexperience, or is it just a natural consequence of civil society returning? These differences have two points. The first is that it is quite a natural thing to happen. The second point is that the opposition came about from an absence of political life. For fifty years, there has been no political opposition party except for the Muslim Brotherhood. Currently, there is a lack of political organization that can unite these personalities into coherent parties, and that makes communication and dialogue difficult. Q: From your perspective, is the Al-Nusra Front extremist? Relatively speaking, I believe the maximum following they have is probably seven thousand people. Generally we have not seen political or military excesses from these groups, which we have seen in Iraq or Afghanistan. The opposition was right not to agree with the Americans designating them a terrorist group. I believe that they came about as a result of the regime sending them to Iraq; those who returned were arrested. This new organization was started by the Syrian people, because they didn’t find those who would support them financially. When the Syrians went to the West asking for help, they were rejected. They went to the Arab world, asking for help and no help was forthcoming. So some who were linked with various organizations–and I do not know who they are–supported them. Those who are with them are not with them ideologically, but rather because they can protect themselves. Q: Do you think the West can communicate with the Al-Nusra Front? First, we want the West to understand our society. It is possible to communicate with these groups. But there is a need to approach the problem without an ideological agenda that can accept other viewpoints. I am not defending Al-Qaeda in terms of their ideology; movements that destroy and kill are rejected in Islam. But the Western approach is imprisoned by an ideological framework. There is a dislike of Islamic civilization, as has been expounded in works such as The Clash of Civilizations. There has to be respect and humility when discussing with opposition groups. Q: What does the SMB envision for Syria after the fall of the Assad regime? Everyone should be a citizen in Syria. The West looks at religious states through the prism of Western civilization, and political terminology needs to be understood in its context. The understanding of faith and religion differ with each respective civilization. We want a civil state and not a theocratic one, because Islam does not have a clergy that runs the state in the first place. For us, religion is a framework that does not enter into the details; the rules of religion with respect to the public law [make up] only five percent [of all rules]. The rest of it pertains to the private individuals’ conduct in the Shari’a. For us, the Shari’a is about the interest decided by the governed. We will not bring laws which are not agreed on by the citizens; Shari’a can be expressed within the framework of democracy. So if we say that extra-marital relationships are forbidden and [it is] agreed on in parliament, we will go with it; if it is rejected, we will not. This is what we mean by a civil government. Q: What about accommodating the minorities? The issue of minorities is exaggerated. In Syria, we have always accommodated minorities; we celebrate Christian Easter [and] Christmas, and the Eids all are all public holidays. In the UK, Eid is not a public holiday. In fact, I don’t expect it to be so in the UK. It is the present government that created this sectarianism. Syria is not Iraq, nor is it Lebanon. The Sunni majority have lived side by side and worked together with the minorities. This is also why we must use the term “citizen,” and not Sunni, Christian and Alawite. If we use this term, then sectarianism can be forgotten. Similarly, we cannot have a minority ruling the majority–how would the West accept that in their own countries? Q: Who should represent Syrians currently? Many pro-Western Syrians come to West and talk as if they represent Syrians. They talk as if Syria will become a part of France or Britain, but they don’t really have much of a following in Syria. The truth is that the people here are religious and they follow religious people, like Moaz Al-Khatib, who are trustworthy. Now we have to find someone who can understand the West and Syrian people. They have to be a bridge between the two. The Ulema [religious scholars] do have a positive role in hemming in the anger in Syrian society, especially in the villages. Q: What is the difference between the SMB and the Egyptian Muslim Brotherhood? From an ideological perspective, there is not a big difference between us and them, but we are separate organizations. The leader of the Egyptian Muslim Brotherhood does not rule over all the groups. Now, for instance, I am criticizing Mursi–and maybe they are upset with me for that–but the relationship is still one which is based on love and desire for the same objective. Where we differ is in our policies. For example, Egypt wants to have a fatwa council, which Al-Azhar approves; we don’t want that. We say that what is permissible and what is forbidden is clear. We don’t want to enter the realm of theocracy. Syrian society is different from Egyptian society. The political experience in Egypt is different from ours, and I believe personally that the Egyptian Brotherhood made a tactical mistake. Egypt was a sinking ship, and you can’t come and change it in the way that you are doing. I believe that we have to work within a coalition. I think that Aboul-Fotouh would probably have been a better choice. This is why they are in a difficult position now. There are also outside powers who want to see the Muslim Brotherhood fail. They don’t want to see something like Turkey. Q: What are some of the difficulties the Syrian opposition is facing? Our five people represent 5000 others, but if you asked other candidates who they represent, they will reply that they represent themselves. This lack of political organization makes communication and dialogue difficult. Many personalities are also idealistic and may not necessarily be realists. Sometimes they represent an idea over the practical issues of party politics. You cannot create a political party with them, except [if] you create a party and give them leadership or an executive role. Forming an executive is difficult because inevitably you have to leave some in and exclude others. This, of course, causes some resentment among the excluded. If there had been a strong political organization this would not have been a problem, since this is quite natural in political life. Q: Why are you only helping groups affiliated with the Syrian Brotherhood? This is not correct. We do not put this as a condition for rendering help. People think wrongly that the SMB has money, and we simply don’t have it. There are also other reasons: before giving money, we need to establish who they are. There are a lot of armed groups who may use weapons or things that are against their own compatriots in brigandage, and so on. We need to establish their credentials before giving [help] to them. Same thing with aid: before distributing it, there has to be the infrastructure in place in order to deliver this aid. Q: There are media outlets that have reported that there are some Free Syrian Army Brigades linked to you. Can you confirm this? British press coverage has served the Assad regime. We believe that there are some parties who have vested political interests, like the Syrian pro-regime lobby working against the revolution. We have approached the left in Britain and they say we are with the USA; when we go to the US they say we are with the Al-Nusra Front; when we go to the Turkish opposition they say we are with Qatar. All of them are playing with the human rights of Syrian people. If Assad stays, you will see Europe flooded with 15 million Syrian refugees. We have found the British media to be contradictory, and the position of the British government is far more advanced than the British press; the American press coverage is better in this regard. Q: If Assad left for Russia tomorrow, would the conflict end? Yes, if Assad and his group went and the war ended, we [could] set up national dialogue and re-establish trust in order for Syria to reconcile. Q: What is your opinion of Iran? Iran is part of the region and they have an important role to play. When the Iranian Revolution happened, we thought it was a good thing. However, we wish that the Iranian revolution–especially in a globalized world–worked within a human rights framework, as opposed to sectarian one. Iran has currently taken the wrong position. Iran needs to work hard to repair its relationship with the Arab world because of their current position. If you asked me five years ago if I had any issues about them having nuclear weapons, I would have said no and would have defended their right to do so. But now I am worried, because we will be hemmed in by two nuclear powers: Israel on one side and Iran on the other. Unfortunately, they are the ones who created this situation. I don’t want them to become a nuclear power after seeing how they have behaved. I have come to believe that Iran has become a strategic danger; at the same time, we don’t want to make Iran out as the eternal enemy. Q: What is the SMB’s position on the Israeli-Palestinian conflict? We support Palestinian rights wholeheartedly. It does not mean that once we are in power we will marshal the horses and get ready the soldiers of God. Far from it. The Egyptian Brotherhood ratified the Camp David Accords without backing down on their support for the Palestinian people. We believe that there is international law, which has already designated Israel a pariah state, and we will support the Palestinian cause through these means.